The Festival of Lessons and Carols is a service of Scripture and song that dates to the late 19th century. In this service, we listen to nine Scripture lessons which recount the Fall, the promise of a Messiah, the Incarnation, and the Great Commission to preach the Good News. Each lesson is followed by a carol or other song that reflects on the lesson's message and a brief prayer. Please consider joining us for this joyous event. Invite family and friends to come hear music by J.S. Bach, Anne Heider, Michael Card, Amy Grant, & many others. 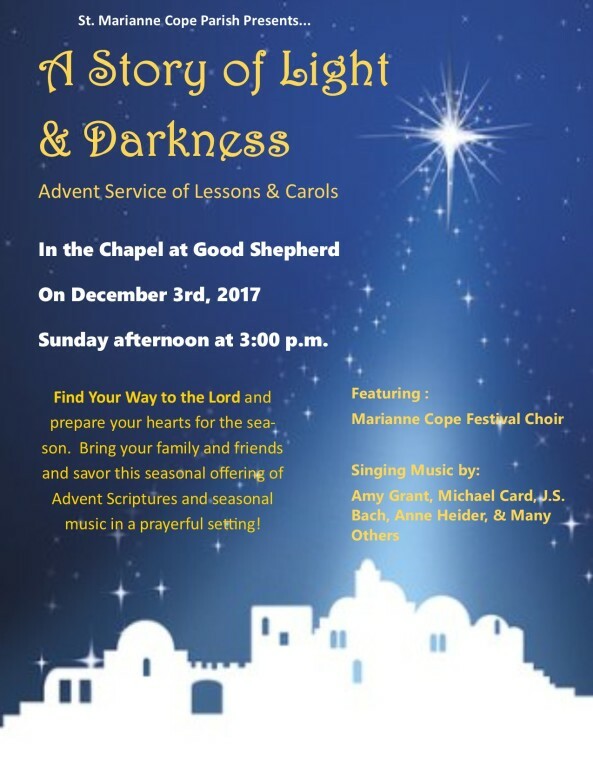 "Find your way to the Lord" and prepare for the coming Christmas season and the birth of Christ by participating in the celebration of scripture and song. Please call St. Marianne Cope Parish office if you have any questions at 334-3518.